Does northern New England get enough sunlight for solar to make sense? The grass is always greener on the other side, and the sun always shines brighter in retirement states. Even so, Vermont and New Hampshire have no trouble sustaining healthy yards and pastures, and we easily get enough sunshine for solar to be a sensible choice for energy production. How do Vermont and New Hampshire stack up? About the same as northern Spain! 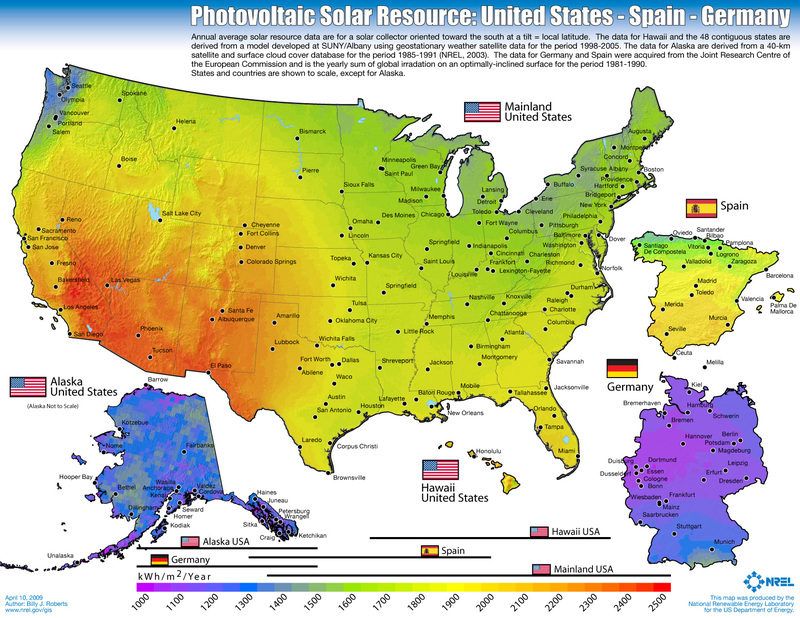 And check out Germany, which is by far the world leader in solar electric generation—its solar resource is pretty much the same as Alaska’s. Beyond that, there’s the financial “proof in the pudding” of solar viability in our region. A residence in Vermont or New Hampshire with a Solaflect PV Tracker receiving good solar access (i.e., not too much shade from trees, etc.) is looking at a lifetime cost of energy that ranges from far below to more-or-less at current utility rates, depending on the utility and the specifics of the installation. This is true even if you ignore the 30% Federal tax credit! Yes, in terms of both energy and finances, solar makes excellent sense in northern New England. We will be happy to provide a free site evaluation to help you understand how sensible solar is for you in your particular location, with your particular property conditions.